Prototype: German Federal Railroad (DB) class V 80 with diesel hydraulic drive and universal joint drive shaft power transmission. Era III, B-B wheel arrangement. The locomotive looks as it did around 1957. Model: The locomotive has an mfx digital decoder and extensive sound functions. It also has a special motor with a flywheel. 4 axles power. Traction tires. The triple headlights and dual red marker lights change over with the direction of travel, will work in conventional operation, and can be controlled digitally. The headlights at Locomotive End 2 and 1 can be turned on/off separately in digital operation. When the headlights are off at both ends of the locomotive, the double "A" light is on at both ends. The cab lighting can be controlled separately in digital operation. Maintenance-free warm white and red LEDs are used for the lighting. The locomotive has current-conducting couplers that can be controlled digitally. The locomotive has a representation of the cab interior. A locomotive figure is included. Length over the buffers 14.7 cm / 5-3/4". Diesel-Hydraulic Trail Blazer. The class V 80 rang in a new era in German locomotive design. Starting in 1952, these locomotives were the first units placed into service with hydraulic power transmission. Other technical innovations were the welding technology used on the frame and superstructure as well as on the trucks. The propulsion system was equipped with 1,100 horsepower motors from MTU and an equally, fundamentally new universal shaft power transmission, both of these features constituting trail-blazing new developments. These units were also delivered for their planned service with multiple unit control for m.u. operation and shuttle train service. The railroad followed the aesthetics of the 1950s with a flowing, rounded locomotive body. The V 80 was used with commuter and fast passenger trains. It was also used for light freight trains. The car set to go with this locomotive can be found in the Märklin MHI H0 assortment under item number 43131. Prototype: Bavarian class S 2/6 steam express locomotive in a black/red basic paint scheme as the German State Railroad Company (DRG) class 15. Locomotive road number 15 001. The locomotive looks as it did around 1925. Model: The locomotive has an mfx digital decoder and extensive sound functions. It also has controlled high-efficiency propulsion. 2 axles powered. Traction tires. The 72270 smoke unit can be installed in the locomotive. The dual headlights change over with the direction of travel. They and the smoke unit that can be installed in the locomotive will work in conventional operation and can be controlled digitally. The headlight for oncoming trains and the cab lighting can be controlled in digital operation. Maintenance-free warm white LEDs are used for the lighting. The locomotive has detailed running gear with a partially open bar frame. The locomotive is modeled to show streamlined sheathing of the smoke box, smoke stack, dome, and cylinder group as well as the streamlined cab. There is a close coupling between the locomotive and tender. A close coupler with a guide mechanism and an NEM pocket is mounted on the rear of the tender. The minimum radius for operation is 360 mm / 14-3/16". Protective sleeves for the piston rods are included separately. Length over the buffers 25.1 cm / 9-7/8". The Bavarian Class S 2/6 Steam Express Locomotive At the start of the 20th century, experiments by different German state railroads in fast running attracted attention to their systems. The Bavarian State Railroad (K.Bay.Sts.B.) also contracted in 1905 for a fast locomotive as part of this "intoxication with speed". As early as a year later Maffei delivered the S 2/6 with the road number 3201 as designed under the close supervision of chief designer Anton Hammel. The S 2/6 was a 4-4-4- hot steam compound locomotive with a bar frame, 150 km/h / 94 mph maximum speed and 16 metric tons axle load. The running gear was a new concept with the pilot and trailing trucks for guiding the locomotive and the development of the water tank in the tender as a self-supporting design. Although the locomotive did not have a completely streamlined sheathing, there were several elements to the locomotive's appearance intended to reduce wind resistance. In front of the cylinders was a curved sheathing. The smoke box door was conical in shape and the smoke stack and steam dome both had shapes to reduce wind resistance. The cab was also designed to be streamlined, and it transitioned seamlessly into the boiler sheathing. In July of 1907, the locomotive reached the maximum speed of 154.5 km/h / 96 mph with a 150 metric ton experimental train on the route Munich� Augsburg and thereby set a world speed record. The locomotive was initially based in Munich. It came to Ludwigshafen in 1910 and initially ran from there with express trains to Strasbourg and Bingerbrück. In 1922, it came back to Munich, and from 1923 on it was stationed in Augsburg. It never bore its DRG road number 15 001 because as early as 1925 this one-off unit was given a place of honor in the Nürnberg Transportation Museum. The S 2/6 thus played undoubtedly a tragic double role in its history. To be sure, it was technically ahead of its time in 1906 and it met the planned requirements for its realization as a piece of motive power. However, its design was overtaken after a very short time in service by the rapidly changing external conditions. For with the exception of a few years in operation in the Palatine area, the S 2/6 soon saw itself forced into a secondary role as an unloved one-off design. Aside from the record runs in 1907, it remained a design quickly overtaken by the times. It was never built as a production locomotive and disappeared after a few years from regular service. Yet, its historic significance does not lie in its service life but is grounded in its technological and design role as a pioneer, which strongly influenced more than locomotive building. Prototype: Royal Bavarian State Railroad (K.Bay.Sts.B.) class EP 3/6. Original version with a steam heat boiler for passenger trains. Road number 20104. The locomotive looks as it did around 1915. Model: The locomotive has the new mfx+ digital decoder and extensive sound functions. It also has controlled high-efficiency propulsion. 3 axles and a jackshaft powered. Traction tires. The locomotive has a factory-installed 72270 smoke unit. The triple headlights and dual red marker lights change over with the direction of travel, will work in conventional operation, and can be controlled digitally. When the headlights are turned off at both ends of the locomotive, then both ends have the double "A" light on. Maintenance-free warm white and red LEDs are used for the lighting. The older style pantographs are asymmetrically arranged. The locomotive has a reproduction of the steam heat boiler. Current-conducting, operating close couplers are mounted on both ends of the locomotive to provide power for the interior lighting in the 43320 passenger car set that goes with this locomotive. The interior lighting in the passenger cars can be turned on and off in digital operation by means of the current-conducting couplers. A figure of a locomotive engineer is included. Length over the buffers 14.3 cm / 5-5/8". Headlight / marker light changeover now with warm white and red LEDs. Figure of a locomotive engineer included. Current-conducting, operating close couplers included on both ends, for supplying power for the interior lighting in the 43320 passenger car set that goes with this locomotive. 37069 � Bavarian EP 3/6 20104 (Starting in 1926: E 36 04) The route Salzburg � Freilassing � Berchtesgaden was also part of the first electrification program in Bavaria, and an electric test operation was possible starting April 15, 1914. In 1912, the Bavarian State Railroad ordered four locomotives with a 2-6-4 wheel arrangement for passenger service on this route with its many grades and curves from Krauss in Munich (mechanical parts) and SSW (electrical parts). They were taken into operation in April and June of 1914 as road numbers EP 3/6 20101-20104. Their running gear was designed to correspond to the difficult route characteristics: The front pilot truck together with the first coupled wheel set formed a Krauss-Helmholtz frame. The rear pilot truck together with the last coupled wheel set rested in a Krauss-Lotter frame. The first runs showed the marvelous design of the running gear without a fixed wheelbase. The good running features free of hunting and jerking were praised. A special feature was the steam boiler for train heating located behind the front engineer's cab. Its smoke stack projected from the roof. The front pantograph therefore had to be placed in the middle of the locomotive. Electric test operations to Berchtesgaden ended however as early as August 3, 1914 due to the outbreak of World War I. Electric operations did not resume until April 10, 1916. On the DRG, these locomotives ran starting in August 1926 as road numbers E 36 01-04. Their served was reduced drastically with the introduction of the new E 44.5 starting in 1933/34, and they were finally retired between 1941 and 1943. Road number E 36 02 was then converted to a snowplow and survived. It can be admired today in the Bavarian Railroad Museum (BEM) in Nördlingen. A passenger car set to go with this locomotive is offered as item number 43320 exclusively for the MHI in the Märklin assortment. Prototype: German State Railroad Company (DRG) class 56.2-8 steam freight locomotive. Rebuilt Prussian G 8.1 with a pilot truck. German State Railroad lanterns and bell. Type 3T 16,5 coal tender. Road number 56 569. The locomotive looks as it did around 1938. Model: The locomotive has the new mfx+ digital decoder and extensive sound functions. It also has controlled high-efficiency propulsion with a flywheel, mounted in the boiler. 4 axles powered. Traction tires. The locomotive and tender are constructed mostly of metal. The locomotive has a factory-installed 72270 smoke unit. The dual headlights change over with the direction of travel. They and the built-in smoke unit will work in conventional operation and can be controlled digitally. Warm white LEDs are used for the lighting. There is a permanent close coupling with a guide mechanism between the locomotive and tender. The rear of the tender has a Telex coupler that can be controlled in digital operation. The front of the locomotive has a close coupler with an NEM pocket. The locomotive has many separately applied details such as piping and sand pipes. Protective piston sleeves, brake lines, imitation prototype couplers, and figures of a locomotive engineer and a fireman are included. Length over the buffers 21.1 cm / 8-5/16". This model is being produced in a one-time series only for the Märklin Dealer Initiative (MHI). The fourth locomotive of a series of 5 locomotives with traces of authentic weathering. A freight car set to go with this locomotive is being produced under item number 46088 also exclusively for the MHI in the Märklin assortment. Prototype: German Federal Railroad (DB) class 50 steam freight locomotive with a cabin tender. Witte smoke deflectors, 4 boiler domes, shortened running boards, DB Reflex glass lamps, and without inductive magnets. Road number 50 1581. The locomotive looks as it did around 1967. Model: The locomotive has an mfx+ digital decoder and extensive sound functions. It also has controlled high-efficiency propulsion with a flywheel, mounted in the boiler. 5 axles powered. Traction tires. The locomotive and tender are constructed mostly of metal. A 7226 smoke unit can be installed in the locomotive. The triple headlights change over with the direction of travel. They and the smoke unit that can be installed in the locomotive will work in conventional operation and can be controlled digitally. Maintenance-free warm white LEDs are used for the lighting. There is a permanent close coupling with a guide mechanism between the locomotive and tender. The rear of the tender and the front of the locomotive have close couplers with NEM pockets and guide mechanisms. The minimum radius for operation is 360 mm / 14-3/16". Protective piston sleeves, brake hoses are included. Length over the buffers 26.5 cm / 10-7/16". Prototypical design changes to the locomotive, shortened running boards included. Class 50 Steam Freight Locomotive The class 50 locomotive came into being shortly before the start of World War II as the last of the so-called "standard design steam locomotives". From April to July of 1939 Henschel built the first twelve locomotives which was soon destined to become the German State Railroad's most successful design, because this 2-10-0 locomotive with its approximately 1,600 horsepower and 80 km/h / 50 mph speed quickly became a general-purpose, sturdy, reliable unit. The outbreak of war on September 1, 1939 caused a leap in the demand for freight locomotives, and the twelve pre-production locomotives were followed by another 3,152 units over the course of the next few years. After the end of the war the DB had more than 2,000 units, which were gradually equipped with the small Witte in place of the large Wagner smoke deflectors, and which mostly lost the running board skirting. The so-called freight train baggage cars were not available in sufficient quantities and formed a big problem on freight trains in the Fifties. Finally, the idea came about of installing a cabin on the 751 tenders of the class 50 units for the train crews. Two large windows ensured a good view to the rear of the train and inside the cabins, there was still room for large work surfaces with table lamps, upholstered folding seats, two emergency seats, a folding washbasin, a ceiling light, two shelves, steam heating, hot plates for heating meals, a water container, and clothing hooks. The class 50 units with or without cabin tenders remained "the" all-round steam locomotives for freight and passenger trains on main and branch lines right up to the end of the steam locomotive era in 1977. A tank car set to go with this steam freight locomotive can be found under item number 46536. Prototype: DB Schenker Rail Deutschland AG class 363 diesel switch engine as a DB Cargo version. Diesel hydraulic propulsion with a jackshaft. Road number 363 241. The locomotive looks as it did around 2014. Model: The locomotive has an mfx digital decoder and extensive sound functions. It also has controlled high-efficiency propulsion. 3 axles and a jackshaft powered. Traction tires. The triple headlights will work in conventional operation and can be controlled digitally. The locomotive has a Telex coupler front and rear, and they can be controlled separately in digital operation. The handrails are constructed of metal. Length over the buffers 12.0 cm / 4-3/4". Double "A" light can be controlled. Prototype: Class 41 steam freight locomotive with a tender. German Federal Railroad (DB) older design version, with Wagner smoke deflectors, older design boiler, type 2Ž2ŽT34 standard design box-style tender, German State Railroad lanterns, without inductive magnets and with buffer plate warning stripes. Road number 41 255. The locomotive looks as it did around 1951. Model: The locomotive has an mfx+ digital decoder and extensive sound functions. It also has controlled high-efficiency propulsion with a flywheel, mounted in the boiler. 4 axles powered. Traction tires. The locomotive and tender are constructed mostly of metal. A 7226 smoke unit can be installed in the locomotive. The dual headlights change over with the direction of travel. They and the smoke unit that can be installed in the locomotive will work in conventional operation and can be controlled digitally. Maintenance-free warm white LEDs are used for the lighting. There is a permanent close coupling with a guide mechanism between the locomotive and tender that can be adjusted for the track curves. The rear of the tender and the front of the locomotive have close couplers with NEM pockets and guide mechanisms. The minimum radius for operation is 360 mm / 14-3/16". Protective piston sleeves, brake hoses are included. Length over the buffers 27.5 cm / 10-13/16". A wide variety of operational and sound functions that can be controlled digitally. Prototype: Class 03 express steam locomotive with a tender. German Federal Railroad (DB) older design version, with Wagner smoke deflectors, older design boiler, type 2Ž2ŽT34 standard design box-style tender, German State Railroad lanterns, inductive magnet on one side and buffer plate warning stripes. Road number 03 266. The locomotive looks as it did around 1954. Model: The locomotive has an mfx+ digital decoder and extensive sound functions. It also has controlled high-efficiency propulsion with a flywheel, mounted in the boiler. 3 axles powered. Traction tires. The locomotive and tender are constructed mostly of metal. A 7226 smoke unit can be installed in the locomotive. The dual headlights change over with the direction of travel. They and the smoke unit that can be installed in the locomotive will work in conventional operation and can be controlled digitally. Maintenance-free warm white LEDs are used for the lighting. There is a permanent close coupling with a guide mechanism between the locomotive and tender. The rear of the tender has a close coupler with an NEM pocket and a guide mechanism. The minimum radius for operation is 360 mm / 14-3/16". Protective piston sleeves, brake hoses are included. Length over the buffers 27.5 cm / 10-13/16". Prototype: German Federal Railroad (DB) class 01 express steam locomotive with a type 2Ž2ŽT34 coal tender. Large Wagner smoke deflectors, silver boiler bands, buffer plate warning stripes. Road number 01 126. The locomotive looks as it did around 1950. Model: The locomotive has an mfx+ digital decoder and extensive sound functions. It also has controlled high-efficiency propulsion with a flywheel, mounted in the boiler. 3 axles powered. Traction tires. The locomotive and tender are constructed mostly of metal. The locomotive has a factory-installed 7226 smoke unit. The dual headlights change over with the direction of travel. They and the smoke unit will work in conventional operation and can be controlled digitally. The locomotive has firebox flickering. Maintenance-free warm white LEDs are used for the lighting. There is a permanent close coupling with a guide mechanism between the locomotive and tender that can be adjusted for track curves. The rear of the tender has a close coupler with an NEM pocket and a guide mechanism. Protective piston sleeves, brake hoses, and figures of a locomotive engineer and a fireman are included. The minimum radius for operation is 360 mm / 14-3/16". The model comes in an attractive wooden case with a certificate of authenticity. Length over the buffers 27.5 cm / 10-13/16". 90 Years of the Class 01 Express Steam Locomotives The class 01 was the epitome of German express steam locomotives for many years almost up to the end of steam motive power in both German states. 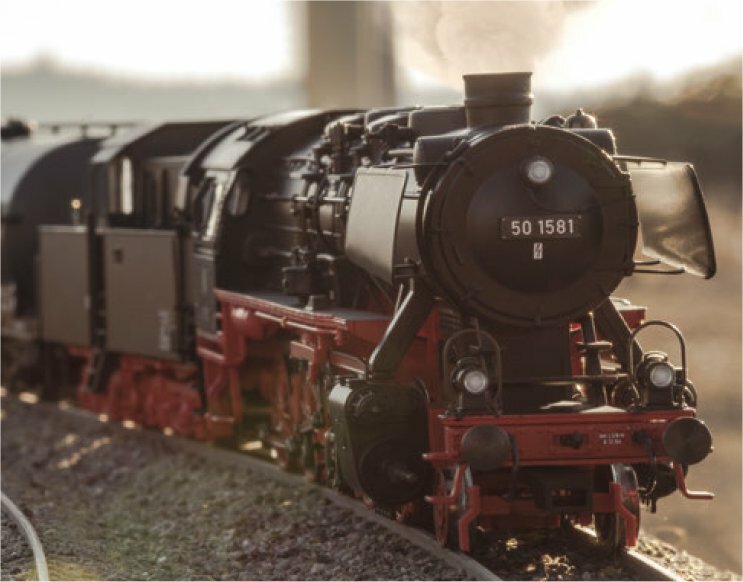 Neither lay people nor experts could escape the fascination of these locomotives and the manner in which they delivered power, elegance, and speed. A two-cylinder and a four-cylinder compound express locomotive was included in the first type plan for the DRG established in 1920. These units were identical in all other parts. Starting in 1926 exhaustive comparison runs were done with ten each of the two classes that ended up in favor of the two-cylinder units. Regular production of the twin locomotives began with road number 01 012 starting in 1927. Procurement of them did not end until 1938. They were built over a period of more than twelve years which almost inevitably resulted in different design changes. After World War II 171 units remained with the later DB and 70 came to the later DR. Five DB units were equipped in 1950/51 with Henschel mixed pre-heaters and all of the DB 01 units gave up their large smoke deflectors in favor of the small Witte units. Both German state railroads decided at the end of the Fifties to update or rebuild part of their 01 locomotives. On the DB 50 units were equipped starting in 1957 with new welded high-efficiency boilers. The DR's rebuilding program changed 35 locomotives fundamentally as the new class 01.5. Numerous locomotives remain preserved and at least one example of each class are even operational. Prototype: German Federal Railroad (DB) standard design "Donnerbüchsen" / "Thunder Box" passenger cars. Type Abi, 1st and 2nd class, type Bi, 2nd class, and type Pwi baggage car. Bottle green paint scheme. The cars look as they did around 1957. Model: All of the cars have factory-installed LED interior lighting and current-conducting couplers. The baggage car has built-in marker lights and a pickup shoe installed. The passenger cars have open platforms and crossovers. The baggage cars has sliding doors that can be opened. Total length over the buffers 48.3 cm / 19". Baggage car has built-in marker lights. New lanterns on the baggage car. The diesel locomotive to go with this car set can be found in the Märklin MHI H0 assortment under item number 36082. Prototype: 3 different design Royal Bavarian State Railroad (K.Bay.Sts.B.) 3-axle passenger cars, for use on the route Salzburg-Freilassing-Berchtesgaden. 1 type ABü three-axle passenger car, 1st/2nd class. 1 type Cü three-axle passenger car, 3rd class. 1 type Pü three-axle baggage car. The cars look as they did around 1915. Model: All of the cars have factory-installed interior lighting with maintenance-free LEDs. Each car has factory-installed current-conducting operating close couplers at both ends. The entire car set can be supplied with power from the EP 3/6 electric locomotive (item number 37069) by means of the built-in current-conducting close couplers. The interior lighting can be controlled digitally from the locomotive. All of the cars are individually packaged and have a master package. Total length over the buffers 47.2 cm / 18-9/16". Used on the route Salzburg - Freilassing - Berchtesgaden. Current-conducting close couplers between the individual cars. The interior lighting for the car set can be controlled digitally from the 37069 locomotive. The class EP 3/6 electric locomotive goes well with the 43320 passenger car set. 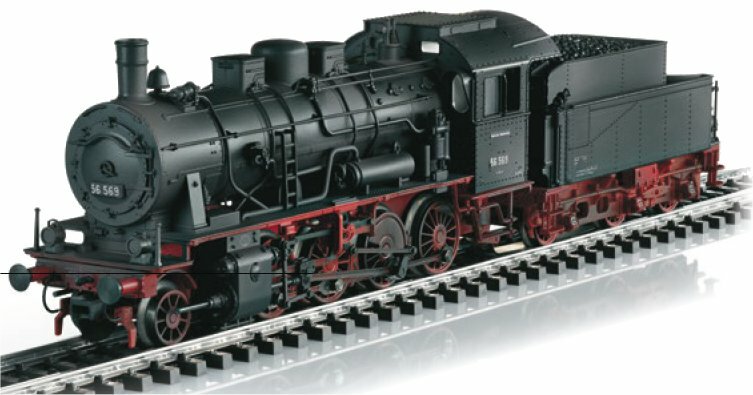 It is also being offered exclusively for the MHI in the Märklin assortment as item number 37069. This passenger car set can be found in a DC version in the Trix H0 assortment under item number T24609. Prototype: German Federal Railroad (DB) type Gmms 40. Prototype: German Federal Railroad (DB) type X-05. Model: The car has Relex couplers. Length over the buffers 10.7 cm / 4-1/4". DC wheel set 2 x 700580. Model: This is a four-axle car with Relex couplers. The car body has commonly used knobs that invite you to build with clip-on blocks. Length over the buffers 16 cm / 6-5/16". DC wheel set 4 x 700580. This car is compatible with the blocks of all well-known manufacturers. Model: The Om Königsberg and O Nürnberg gondolas are loaded with real coal. The stake car has a load of wood. All of the cars are authentically weathered and have different car numbers. They are individually packaged. Total length over the buffers approximately 66.5 cm / 26-3/16". DC wheel set for the beer car 2 x 700270, for all of the other cars, per car 2 x 700580. Prototype: Standard design tank cars, used on the German Federal Railroad (DB). Older design with pressed metal trucks and brakeman's platforms. Privately owned cars painted and lettered for VTG United Tank Storage and Transportation, Inc., Hamburg, and BP Gasoline and Petroleum, Inc., Hamburg. The cars look as they did at the start of the Sixties. Model: The cars have special quiet-running trucks. They also have separately applied ladders and catwalks. The cars have separately applied tank signs. All of the cars have different car numbers, are individually packaged and marked. Length over the buffers per car 14.2 cm / 5-5/8". DC wheel set per car 4 x 32376004. This tank car set is the right add-on for the class 50 steam freight locomotive with a cabin tender that can be found under item number 37835. Prototype: Type Tbis 871 sliding roof / sliding wall car with platforms at the ends, used on the Märklin Railroad (MB). The car looks as it did around 1987. Model: The car has separately applied platforms at the ends. DC wheel set 2 x 700580. New tooling for the types Tbis 871 sliding roof / sliding wall car. One-time series. Märklin Magazin Annual Car for 2015. Prototype: 2 German State Railroad Company (DRG) type Gh "Hannover" (Bavarian design) boxcars. Cars from the first production run with flat roofs. Used as milk cars to ship "fresh milk to Nürnberg Main Station". Grayish white basic paint scheme. Both cars look as they did around 1930. Model: Each of the boxcars has 6 Grove design vents on the roof. Each car with continuous running board on each side of the car below the sliding doors. The cars have steps at one end. Both boxcars have different car numbers. Total length over the buffers 22.2 cm / 8-3/4". DC wheel set per car 2 x 700580. New tooling for the Bavarian design two-axle milk cars with a flat roof. Interesting car type for transporting "fresh milk to Nürnberg Main Station". Special freight cars were purchased in Bavaria for milk traffic, above all for the transport of milk cans. The railroad transported the milk cans in this manner from Bavarian dairy farmers who brought their products by wagon or tractor to the nearest station. The railroad cars ran in scheduled passenger trains, which in the past enabled the fastest transport of the perishable milk to the dairies in the city. The light paint scheme was typical for the cars and was supposed to keep temperatures within limits in the summer. Another typical feature were the narrow, opposed sliding doors on both sides. Since the cars were not loaded by forklift or hand truck, narrow doors worked out well. A load conductor on the train, or local personnel, or even the farmer delivering the milk did the manual loading of the 40 liter / 10.5 gallon milk cans. Several load restraints inside the railroad cars served to secure the milk cans. The loading work at the short stops for the passenger trains could be taken care of relatively quickly through the two doors on both sides of the cars. In addition, the milk cans to be unloaded could be pre-sorted during the trip and be placed ready for unloading at one of the doors. Since the milk transport car was run in passenger trains as a rule, it had a Westinghouse design air brake as well as electrical and steam heating lines. This allowed passenger cars running behind the milk car to be heated too. The wooden boards on the ends of the car had slots in them to allow wind to whistle into the car's interior in order to keep the milk somewhat cool during the trip. Riding in a milk transport car thus developed into a drafty experience. 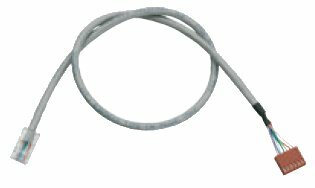 This is an adapter cable for connecting the new 60881 and 60882 S88 modules to the 6088 and 60880 S88 modules. The current S88 feedback modules can be integrated perfectly with this adapter cable into the earlier S88 feedback system. Prototype: Type Tms 851 2-axle sliding roof car with a brakeman's cab. Model: The car is painted and lettered to fit in the series of Märklin Magazin annual cars. Length over the buffers approximately 40 mm / 1-9/16". Prototype: DB Auto Train consisting of two type Avmz compartment cars and 3 type DDm 915 auto transport cars as they looked in Era V.
Model: The cars are finely, prototypically painted and lettered, and all of the cars have individual car numbers. The wheel sets are black nickel-plated. Included with this set are 8 different automobile models that can be loaded on the auto transport cars. Length over the buffers approximately 600 mm / 23-5/8". The dining car to go with this set is available as item number 87743. Prototype: three K.Bay.Sts.B. type Cu express train passenger cars, 3rd class, 1 K.W.St.E. type ABCCü express train passenger car, 1st/2nd/3rd class, and 1 K.Bay.Sts.B. type PPÜ baggage car. Model: The baggage car has been reworked to correspond to the prototype. All of the cars have correct finely executed paint schemes. All of the wheels are black nickel-plated. These models are not available individually. Length over the buffers approximately 440 mm / 17-5/16". One-time series for the MHI. The express locomotive to go with the 87321 car set can be found under item number 88923. Prototype: German Railroad, Inc. (DB AG) type WRmz 135.0 dining car as it looked in Era V.
Model: This car has a fine, prototypical paint scheme and lettering. It has a single-arm pantograph and dark wheel sets. Length over the buffers 120 mm / 4-3/4". The 87743 dining car can be added to the 87092 car set to make up a prototypical train consist for the theme DB Auto Train. Prototype: German State Railroad (DR) class E 244. Model: This is an improved version compared to earlier models of this class. The locomotive has larger buffer plates. The catenary selector screw has been moved to inside the locomotive. The triple headlights are warm white LEDs and they change over with the direction of travel. Both trucks are powered. Length over the buffers 68 mm / 2-11/16". Prototype: General Motors EMD class E8B six-axle B unit painted and lettered for Union Pacific Railroad. Model: The locomotive is completely new tooling. It has a new powerful motor. 2 axles powered on each truck. Traction tires for high pulling power. The locomotive is finely detailed and has extensive, prototypical paintwork and lettering. It also has the Märklin system coupler front and rear. Length approximately 96 mm / 3-3/4". This model is a cooperative project with the firm AZL. 88626 can be added to 88627 for double the pulling power. Prototype: German Federal Railroad (DB) class 52 with a condensation tender in Era III. Model: This locomotive model has been reworked in many respects. It has fully detailed, working valve gear. The locomotive now has rail clearance devices, imitations of brakes, and sand pipes. It also has larger buffer plates. The locomotive has a 5-pole Mini-Club motor. All of the driving axles are powered. The locomotive model is equipped with Witte smoke deflectors and dual headlights with warm white LEDs that change over with the direction of travel. For the first time the locomotive tender has headlights. The pilot truck has solid wheels. Length over the buffers 127 mm / 5". Imitations of brakes and sand pipes. Working headlights on the tender that change over with the direction of travel. 88923 -- Royal Bavarian State Railroad (K.Bay.Sts.B.) class S 3/6 Steam Locomotive. Prototype: Royal Bavarian State Railroad (K.Bay.Sts.B.) class S 3/6. "Wind Splitter" cab included. Model: This model has been reworked in many respects. It has dual headlights with warm white LEDs. A signal lamp (non-working) that can be plugged in on the upper front in the prototype is included. The model is finely detailed with imitations of the brakes, rail clearance devices, larger buffer plates, detailed valve gear, and protective piston rod tubes for the inner cylinders are modeled. The model has new older design buffers with larger buffer plates. It also has an extensive paint scheme. The locomotive has a 5-pole motor. All of the driving axles are powered. Due to the filigree nature of the valve gear and the details, the locomotive requires a minimum radius of 195 mm / 7-11/16" or larger for operation. Length over the buffers 84 mm / 3-5/16". 88923 is the perfect motive power for the 87321 passenger car set. Model: The class 74 steam locomotive is painted and lettered for the Märklin-Magazin. The model has been largely redesigned and is finely detailed. The locomotive body and frame are constructed of metal. The locomotive has brake imitations, rail clearance devices, etc. modelled on its underbody. It has finely detailed valve gear. The locomotive has enlarged buffer plates. The front of the locomotive now has a plastic coupler hook. Warm white LEDs are used for the triple headlights. The locomotive has a 5-pole motor. All 3 driving axles are powered. The wheels are black nickel-plated. Length over the buffers approximately 55 mm / 2-3/16". Brake rigging and rail clearance devices modelled. 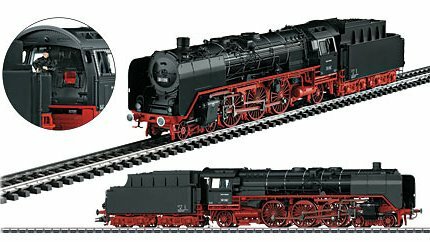 The 88953 steam locomotive can be added to the previous Märklin Magazin cars to make a complete train. Prototype: German Federal Railroad (DB) class E 10.1. Express locomotive with a squared off body, 5 headlights / marker lights, continuous rain gutter, and high-efficiency vents. Cobalt blue basic paint scheme. The locomotive looks as did it around 1964. Model: The locomotive has a new road number and is extensively weathered. The frame and the truck frames are constructed of metal. The superstructure is constructed mostly of metal. The locomotive has an mfx digital decoder, controlled high-efficiency propulsion, and extensive sound functions. It can be operated with AC power, DC power, Märklin Digital, and DCC. The locomotive has a powerful, centrally mounted motor and drives all of the axles in both trucks by means of cardan shafts. In digital operation, the double arm pantographs can be raised and lowered by motors. The white headlights and red marker lights are LEDs. They will work in conventional operation and can be controlled digitally. White LED lights are on in the engineer's cab at the front of the locomotive, depending on the direction of travel. The doors for the engineer's cab can be opened. The cabs have interior details and Engineer's Cab 1 has a figure of a locomotive engineer. There are metal grab irons and many other separately applied details: DB sign plates, antenna, windshield wipers, a whistle, buffer beams with sprung buffers, and separately applied brake lines. The locomotive comes from the factory with claw couplers mounted on it; they can be replaced by 2 reproduction prototype couplers that are included with the locomotive. The minimum radius for operation is 1,020 mm / 40-1/8". Length over the buffers 51.5 cm / 20-1/4". In digital operation, the double arm pantographs can be raised and lowered by motors. The model is extensively weathered. Prototype: German Federal Railroad (DB) type A4üm-61 (12 030 München) express train passenger car, 1st class. Cobalt blue basic paint scheme. Prototype: German Federal Railroad (DB) type B4üm-61 (19 395 München) express train passenger car, 2nd class. Chrome oxide green basic paint scheme. Another model variation with a different car number can be found under item number 58028. Prototype: German Federal Railroad (DB) type B4üm-61 (19 407 München) express train passenger car, 2nd class. Chrome oxide green basic paint scheme. Another model variation with a different car number can be found under item number 58027. 58046 -- DB type AR4üm-54 (11 869 München) half dining car. Prototype: German Federal Railroad (DB) type AR4üm-54 (11 869 München) half dining car. Crimson / cobalt blue basic paint scheme. Prototype: German Federal Railroad (DB) type BD4üm-61 (95 162 München) half baggage car. Chrome oxide green basic paint scheme. Prototype: Swiss Federal Railways (SBB/CFF/FFS) type Eaos high side gondola. Model: The frame and car body are made of plastic with many separately applied details. Minimum radius for operation 1,020 mm / 40-3/16". Length over the buffers 43.8 cm / 17-1/4". Another variation with its own car number can be found under item number 58804. Prototype: German Federal Railroad (DB) type Klm 441 low side car. Model: New car number. This car type is completely new tooling very finely constructed of plastic with very many separately applied details. This is the version without a brakeman's platform, with metal sides, without stakes. The car comes with the system couplers mounted, prototype reproduction couplers, and brake hoses for installation on the cars. Minimum radius for operation 1,020 mm / 40-3/16". Length over the buffers 37.5 cm / 14-3/4". Prototype: German Federal Railroad (DB) type Rmms 33 "Ulm" stake car. Model: New car number. The "Ulm" car type is completely new tooling and is very finely constructed of plastic with very many separately applied details. This is the version with a brakeman's platform, with wood sides, and with wood stakes on the sides and metal stakes on the ends. The stakes are removable and can be stored in the stake box. The car comes with the system couplers mounted, prototype reproduction couplers, and brake hoses for installation on the cars. Minimum radius for operation 1,020 mm / 40-3/16". Length over the buffers 37.8 cm / 14-7/8". Prototype: German State Railroad Company (DRG) type Rmm "Ulm" stake car with a Lanz rail vehicle as a load. Model: New car number. The model is completely new tooling and is very finely constructed of plastic with very many separately applied details. This is the DRG version with wood sides, with wood stakes on the sides and metal stakes on the ends, and with a brakeman's platform. All of the stakes are removable as in the prototype of course and can be stored in the stake box. The car comes with the system couplers mounted, prototype reproduction couplers, and brake hoses for installation on the cars. Minimum radius for operation 1,020 mm / 40-3/16". Length over the buffers 37.8 cm / 14-7/8". The car has a Lanz rail vehicle as a load. The Lanz rail vehicle can be rolled, features metal and real wood construction, and is mounted in place on a real wooden load frame. A model of a Lanz rail vehicle on a real wooden load frame included. Prototype: German Federal Railroad (DB) type Gllh III "Leig" unit pair of freight cars with the lettering "Stückgut-Schnellverkehr" ("Less-than-Carload-Lot-Express-Service"). Model: These cars have new car number in order to form prototypical units. This type Gllh 12 pair of cars is completely new tooling and is very finely constructed of plastic with many separately applied details. One car has a brakeman's cab and a hand brake, and one car does not have a brakeman's platform. The doors on the model can be opened and the cars have sprung buffers. In addition, the cars also have interior details. The pair of cars is prototypically coupled together. They come with the system couplers mounted, prototype reproduction couplers, and brake hoses for installation on the cars. Minimum radius for operation 1,020 mm / 40-3/16". Length over the buffers 76.2 cm / 30". The DB "Leig" Unit As early as the Mid-Twenties the German State Railroad (DRG) was faced with competition from trucks. The less-than-carload-lot service most of all had to be accelerated in order not to lose more market share. The DRG therefore developed a new transport concept in 1927, whereby less-than-carload-lot freight was hauled in its own trains and was to be sorted in route. This saved time-consuming switching maneuvers for loading and unloading along the route. Actually, these so-called "Leichten Eil-Güterzüge" ("Light Fast Freight Trains") ("Leig" for short) were supposed to be hauled by newly developed powered baggage rail cars but they were not available yet and were never built except for a few individual samples. Initially, use was made of locomotive-hauled short trains and the conversion of existing freight cars as a cost-effective "emergency solution". On each pair of cars, a shock absorption plate replaced a buffer on one side at one end of the cars and the buffer on the other side was replaced by a buffer without a plate in order to achieve two close-coupled cars in this manner. At the close-coupled end with a spacing between the cars of only 54 cm / 21-1/4", large openings were cut into the end walls and the space between the cars was bridged by a walkover plate and a diaphragm. The result was a large connected workspace. The first "Leig" units still consisted of a boxcar and a freight train baggage car. After just a short time, "Leig" units were made from two high-capacity cars. The permissible maximum speed was increased to 100 km/h / 62 mph after changes to the suspension for the cars. The sidewalls for these boxcars bore the lettering "Stückgut-Schnellverkehr" ("Less-than-Carload-Lot Express Service") in different versions, whereby the variation known to everyone and often selected had ascending black lettering on a white background. The "Leigs" were usually coupled together in "Leichtgüterzügen" / "Light Freight Trains" with a maximum of ten axles, sometimes with a gondola for bulky or dangerous freight. With this limitation on the train length, trains could be stopped exactly at station platforms and the freight transfer could be accelerated accordingly. After the end of World War II, the DB at the start of the Fifties stood before the task of replacing and adding to the "Leig" units in the years to come. It purchased the type Gllmehs 52 "Leig" units in large numbers as a result. The DB did not stop running trains of Less-than-Carload-Lot Express Service until the Sixties and the "Leig" units continued to be used only in "normal" freight trains. Prototype: German Federal Railroad (DB) type Gl 11 (Dresden) boxcar. Model: New car number. The type Gl 11 car is completely new tooling and is very finely constructed of plastic with very many separately applied details. This is the version with end reinforcements, air brakes, and without a hand brake. The doors on the model can be opened and the model has sprung buffers. The car comes with the system couplers mounted, prototype reproduction couplers, and brake hoses for installation on the car. Minimum radius for operation 1,020 mm / 40-3/16". Length over the buffers 37.9 cm / 14-15/16". Prototype: German State Railroad Company (DRG) type Gl Dresden boxcar. Without a hand brake. Model: New car number. The type Gl Dresden car is completely new tooling and is very finely constructed of plastic with very many separately applied details. This is the version with end reinforcements, air brakes, and without a hand brake. The doors on the model can be opened and the model has sprung buffers. The car comes with the system couplers mounted, prototype reproduction couplers, and brake hoses for installation on the car. Minimum radius for operation 1,020 mm / 40-3/16". Length over the buffers 37.9 cm / 14-15/16". Prototype: German State Railroad Company (DRG) type Rmms 33 "Ulm" stake car with a Lanz "Ackerluft" Bulldog tractor as a load. Model: New car number. The "Ulm" car type is completely new tooling and is very finely constructed of plastic with very many separately applied details. This is the DB version with steel sides, with pressed sheet metal stakes on the sides and steel stakes on the ends. All of the stakes are removable as in the prototype of course and can be stored in the stake box. The car comes with the system couplers mounted, prototype reproduction couplers, and brake hoses for installation on the cars. Minimum radius for operation 1,020 mm / 40-3/16". Length over the buffers 37.8 cm / 14-7/8". The car has a metal model of a Lanz "Ackerluft" Bulldog tractor as a load, mounted in place on a real wooden load frame. A model of a Lanz "Ackerluft" Bulldog tractor as a load on a real wooden load frame included. Prototype: Two German Railroad, Inc. (DB AG), DB Cargo business area, type Hirrs-tt 325 sliding wall boxcars. Model: The cars have close coupler mechanisms. Length over the buffers per car 168 mm / 6-5/8". T16372 -- Express Diesel Powered Rail Car SVT "Flying Hamburger"
Prototype: German Railroad, Inc. (DB AG) class SVT 137 Express Powered Rail Car. Earlier German State Railroad Company (DRG) "Hamburg" design. Version as museum powered rail car 137 225. Model: The model has a built-in digital decoder and sound generator for operation with DCC, Selectrix, and Selectrix 2. Motor powering 2 axles built into the Jakobs truck. Both halves of the unit and the Jakobs truck are connected by a guide mechanism thus producing a prototypical look of a close spacing without open space when the model is standing on straight track. The headlights / marker lights change over white / red. They and the interior lighting are LEDs. Total length over the buffers 278 mm / 10-15/16". Prototype: Royal Prussian Railroad Administration (K.P.E.V.) class P8. As it originally looked with a box-style tender. Model: The locomotive and tender are constructed mostly of die-cast metal. The locomotive has a motor with a bell-shaped armature and a flywheel, mounted in the boiler. It also has a built-in digital decoder and a sound generator with the formats DCC, Selectrix, and Selectrix 2. The locomotive and tender are close coupled. 3 axles powered. Traction tires. The locomotive has dual headlights with warm white LEDs. All of the functions can also be controlled in the Selectrix digital format. Length over the buffers 116 mm / 4-9/16". Model: The locomotive has a built-in digital decoder with the digital formats DCC, Selectrix, and Selectrix 2. It also has a guide mechanism for close couplers and a motor with a flywheel. 4 axles powered. Traction tires. The headlights and marker lights change over with the direction of travel. Warm white LEDs are used for the headlights. The cab lighting and the long-distance headlights can be controlled digitally. The outer pantographs can take power from catenary. Length over the buffers 122 mm / 4-13/16". Afterr the class V 200 diesel locomotives were removed from express train service at the end of the Sixties, units designated from 1968 on as the class 220 also pulled freight trains. This model reproduces Road Number 220 085-5 in the original Era IV paint and lettering scheme. The locomotive is equipped with 2 powerful motors, a decoder, sound, and two pulsing smoke generators that reproduce typical exhaust of the prototype. Two general-purpose sockets, traction tires, and many other details are included. Length over the buffers 67 cm / 26-3/8". Complete sound and exhaust gas smoke included. This locomotive goes well with the 40980 and 40981 ore cars and with the 20120 diesel locomotive. Model of a Rügen Bäder Railroad passenger car, also known as the Rasender Roland / Furious Roland. The car has a prototypical paint scheme and lettering for Era VI. It also has complete interior details and doors that can be opened. The car has metal wheel sets. Length over the buffers 58 cm / 22-7/8". This car is the ideal add-on for a train with the 28005 locomotive and the 35359 car set. This car set consists of 3 German Federal Railroad (DB) type Fad 168 high capacity hopper cars for use in unit trains in volume freight service with coal, coking coal, or ore. Each car has its own car number. Length over the buffers for each car 42 cm / 16-9/16". This car set goes with the 23945 class 220 or the 20755 class 139. The 40981 car set can be added to this set. This car set goes with the 23945 class 220 or the 20755 class 139. The 40980 car set can be added to this set.